Hey, check it out: If you purchase this driver, you get a free pack of Starbursts! Mmmm, yummy. Wait.. Check that. This driver uses something called "Starburst" variable face technology. I'm not sure what this is, but Srixon says it increases the C.O.R. by 5%. The C.O.R. (for you non-golf nerds) is the trampoline effect of the driver face. In addition, Srixon uses their own proprietary titanium that lets them move more weight low and deep. This gives the driver a high MOI. Combine this with the "six-part bulge-and-roll" design which controls sidespin, and you have a driver that you can hit long and straight very consistently. I really like the set up of this club. It lines up very square and is very easy to draw. 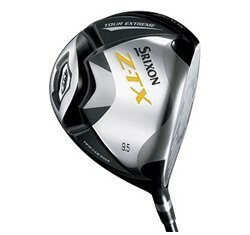 The best thing about the driver is its consistent medium ball flight, straight and high almost every time. The downside is you won't get much roll. The high ball flight is all carry and lands soft with very little run. For those of you looking for a more penetrating low ball flight, take a look at the Callaway Diablo Edge Tour Driver. This driver has a lot of punch and rolls forever.